A retired police chief, who devoted 40 years to the job he loved, has died at the age of 77. Barry Tomlinson joined the force as a cadet at the age of 17 in 1958 and he was later appointed as a police constable in Westhoughton. He then joined the regional crime squad and rose through the ranks to be appointed detective sergeant and detective inspector in 1980 before he was appointed as the Chief Inspector of Burnley. 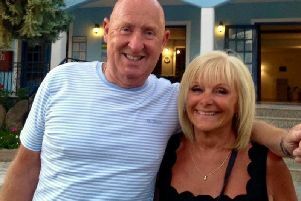 Barry retired in 1998 at the age of 57 and he enjoyed gardening, meals out and socialising with friends and holidays abroad with his wife, Marie. Their favourite destinations included Spain and the Greek island of Crete which they had visited 20 times. Originally from Nelson, Barry attended the former Mansfield High School and sang with the choir at St Mary’s Church in the town. His wife Marie said: “Barry loved his job and he was very dedicated to it. Barry also leaves his sons Michael and Andrew and grandchildren Olivia and Harry.